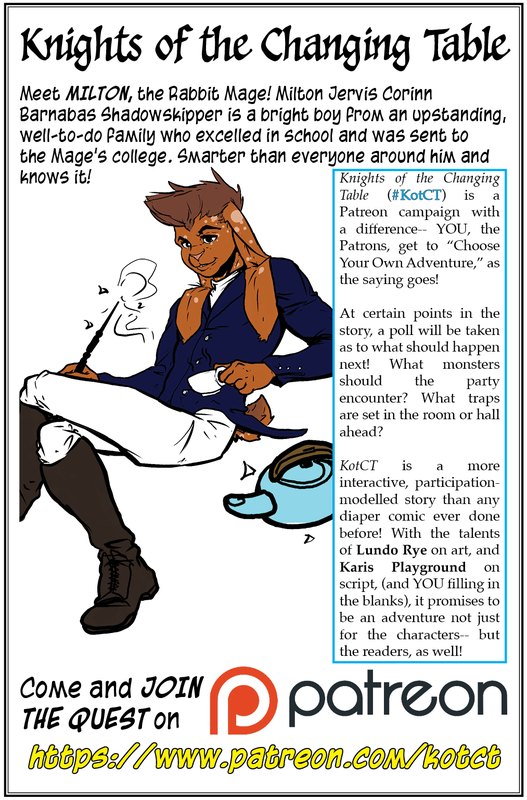 Lundo Rye, a furry artist, and I are collaborating on “Knights of the Changing Table,” a fetish comic about a medieval fantasy adventuring group who run afoul of a strange Keep that is full of fetishy, diaper-oriented traps and monsters! Best of all, we’ll be telling this story in a “Choose Your Own Adventure” style, in which YOU, the reader, will be able to help decide the fates of our heroes! Traps, monsters, accidents, diapers, weight gain… lots of fun things! 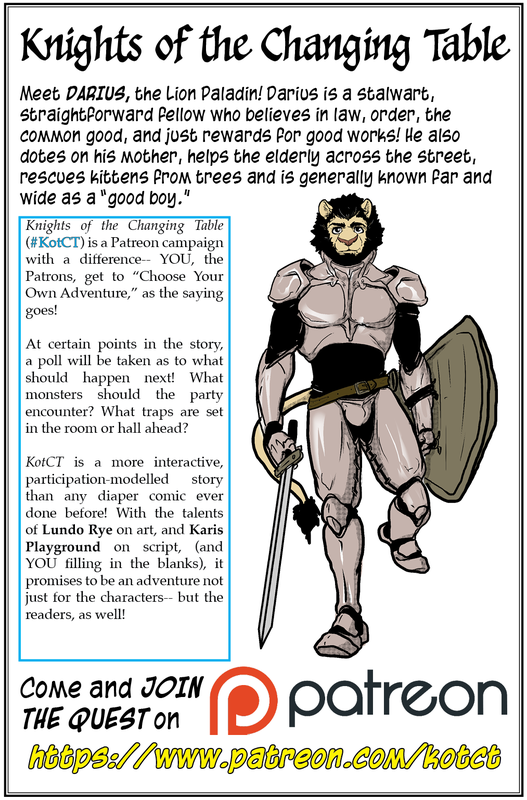 Lundo and I will be funding this with a very special Patreon, where we crowdfund money for the creation of these pages and offer great incentives like: seeing works in progress, voting on the next monster encounter, devising devious (and deviant!) traps for our heroes to encounter, and best of all, the top tier of contributors get to HAVE THEMSELVES DRAWN INTO THE COMIC!! You can be peddler, shopkeepers, tavern owners, townsfolk, or maybe even a “monster” the party meets along the way! Be sure to follow @KarisPlayground on Twitter for the most up-to-date information! And follow the hashtag #kotct ! Hoping to make this exciting for everyone involved– which we can only do if you GET INVOLVED!